By cutting and folding four snowmen, then gluing the halves to other pieces, students get Standing Snowmen. 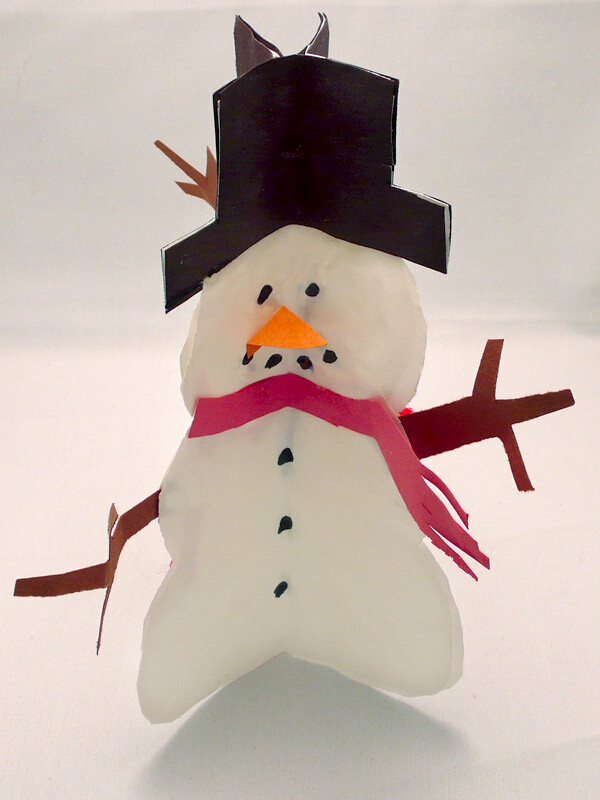 All four snowmen can be decorated differently or all the same. The bottom of them all is flat, so they all stand up. A beautiful ornament for the dinner table or the mantle. Using black marker or crayons, make snowmen symmetrical by adding two black eyes, black mouth (4 dots), and three dots for buttons. Try to put them all in the same places for all snowmen. Either cut out four symmetrical red scarves or use yarn to make identical scarves. When most students have finished this far, have them watch and listen carefully. 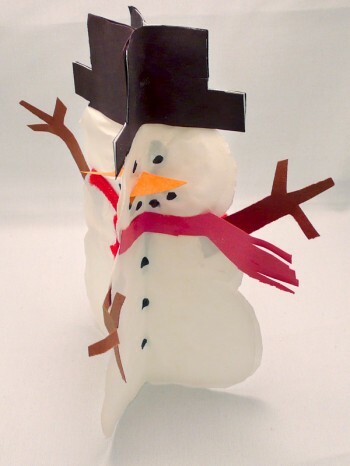 The snowmen have to be folded exactly in half and only one side at a time is glued to the next snowman. For example, the first snowman is glued on his back right side and glued to the next snowman’s back left side. Next, the second snowman’s back right side is glued and joined to the third snowman’s back left side. This continues until the fourth snowman’s back right side is joined back to the first snowman’s back left side. ***Always remember to push the back fold of the snowmen all the way in to the centre of the ornament.